The brilliant bookstore, Open Books in Seattle, is the place for poetry books, readings, and workshops in the Northwest. Their calendar of events is action packed. See for yourself on Sunday, March 3, 2019, at 5:00pm, as Open Books hosts the launch of Gravity Assist by Martha Silano. Martha will be joined by poets Kelli Russell Agodon, Rick Barot, and Molly Tenenbaum. Go! If you care about poetry, and if you’re anywhere near Seattle, or planning a trip to Seattle, here’s a reminder: Open Books. It’s what’s on the shelves, it’s what’s on the walls, it’s who’s on staff, it’s the poetry-packed schedule of readings and workshops. Sometimes it’s even who you run into while you’re browsing. Open Books is open Tuesday-Saturday, 11-6, and Sunday, 12-4. And if you’re not anywhere near, they’ll ship you the poetry you require. Stop by and say thank you. Come hear a rollicking collection of voices at a MoonPath Press reading curated by Risa Denenberg, tonight, Saturday, November 3, 2018, at 7:00pm, at Open Books in Seattle. The stellar lineup features MoonPath poets Ronda Piszk Broatch, Glenna Cook, Alice Derry, Lorraine Ferra, Christopher J. Jarmick, Carol Levin, Rena Priest, Raul Sanchez, and Connie K Walle. 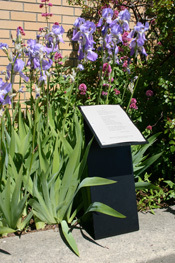 See the poets’ bios here, then join them in person. Open Books: A Poem Emporium invites you to a Storytelling Event Featuring Cave Canem and Kundiman Poets Anastacia-Reneé, Jane Wong, Mia Ayumi Malhotra, Paul Ceballos Hlava, Pimone Triplett, and Quenton Baker. The words begin at 7:00pm. More on Cave Canem. More on Kundiman. Get ready. The Nasty Women Poets are headed your way. Nasty Women Poets: An Unapologetic Anthology of Subversive Verse (Lost Horse Press) is a timely collection of poems that speaks not just to the current political climate and the man who is responsible for its title, but to the stereotypes and expectations women have faced dating back to Eve, and to the long history of women resisting those limitations. In BELLINGHAM, four of these nasty women — Bellingham poets Jennifer Bullis, Susan J. Erickson, and Jessica Lee, and Seattle poet Carolyne Wright — will present a lively array of poems from Nasty Women Poets at Village Books in Fairhaven on Sunday, January 14, 2018, at 4:00pm. In SEATTLE, contributors Kelli Russell Agodon, Jennifer Bullis, Susan J. Erickson, Susan Rich, Martha Silano, Judith Skillman, and Carolyne Wright will share some nastiness at Open Books on Friday, February 2, 2018, at 7:00pm. In REDMOND, poets Jennifer Bullis, Martha Silano, Judith Skillman, and Carolyne Wright will be featured at SoulFood Poetry Night on Thursday, February 15, 2018, at 7:00pm. The nasty women poets included here talk back to the men who created those limitations, honor foremothers who offered models of resistance and survival, rewrite myths, celebrate their own sexuality and bodies, and the girlhoods they survived. They sing, swear, swagger, and celebrate, and stake claim to life and art on their own terms. The anthology, edited by Grace Bauer and Julie Kane, includes work from Kim Addonizio, Jan Beatty, Kelly Cherry, Annie Finch, Alice Friman, Allison Joseph, Marilyn Kallet, Melissa Kwasny, Shirley Geok-lin Lim, Jessica Mehta, Lesléa Newman, Nuala O’Connor, Alicia Suskin Ostriker, Melinda Palacio, Jennifer Perrine, Marge Piercy, Lucinda Roy, Maureen Seaton, Rochelle Spencer, A.E. Stallings, Stacey Waite, Diane Wakoski, Müesser Yeniay, and a fabulous coven of other women’s voices. Other readings are scheduled nationwide (there are nasty women everywhere!) including Baltimore, Cambridge, Kalamazoo, San Francisco, and elsewhere. Watch for them — better yet, ask for them — at a bookstore near you. On Friday, September 29, in Bellingham, Poetry at St. Paul’s opens with a presentation by Gregory Wolfe, editor of Image Journal, followed by a reading by poet Luci Shaw. Events begin at 7:00pm at St. Paul’s Episcopal Church. Also on Friday, September 29, in Deming, Frida and Friends features Susan J. Erickson reading from her book of poems, Lauren Bacall Shares a Limousine, joined by poets Lois Holub, Stephanie Hopkinson, J.I. Kleinberg, C.J. Prince, and Leslie Wharton. The reading begins a 7:00pm at the Deming Library. 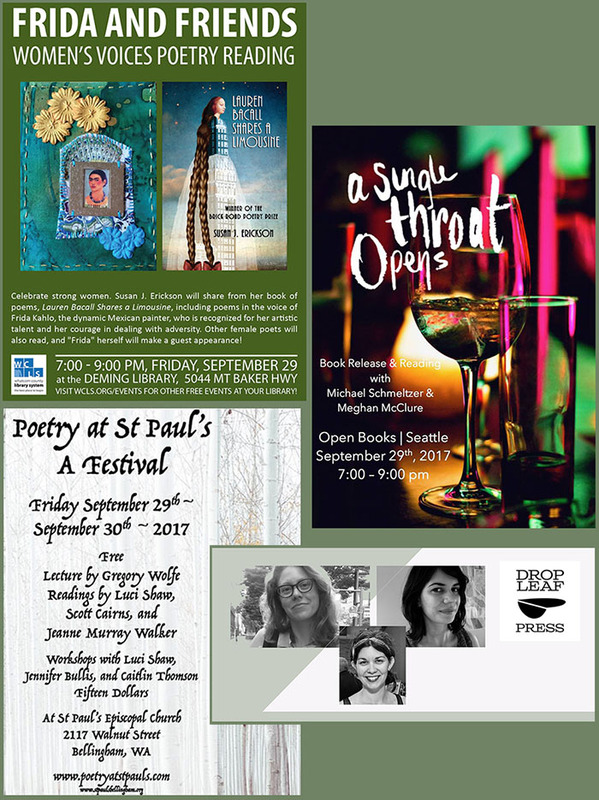 Also on Friday, September 29, 2017, in Seattle, Meghan McClure and Michael Schmeltzer will read from their new collaborative volume, A Single Throat Opens (Black Lawrence Press). Join them at their book launch at 7:00pm at Open Books. On Saturday, September 30, Poetry at St. Paul’s continues with a trio of workshops offered by Jennifer Bullis, Luci Shaw, and Caitlin Thomson. Registration is required. Workshops run concurrently, 1:30-3:00pm, at St. Paul’s. Later on Saturday, September 30, head back to Open Books in Seattle for a launch party for Hailey Higdon’s chapbook, Rural (Drop Leaf Press), featuring readings by the author, Sarah Heady, and Tanya Holtland. This is just a sampling of the weekend’s goings-on. Enjoy!